New Zealanders sometimes refer to their country as God Zone, a quirky twist on the phrase "God's own." And if you like gorgeous scenery and gutsy people, you'll agree with them. New Zealand is blessed with some of the most varied and dramatic terrain in the world, from glaciers and fjords and beaches to mountains and meadows and rain forests. New Zealanders sometimes refer to their country as God Zone, a quirky twist on the phrase “God’s Own.” And if you like gorgeous scenery and gutsy people, you’ll agree with them. New Zealand is blessed with some of the most varied and dramatic terrain in the world, from glaciers and fjords and beaches to mountains and meadows and rain forests. AND here you get to admire the breathtaking scenery while on one of your greatest ever mountain bike tours. 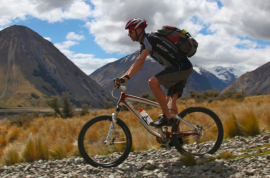 We have put together our favourite bike tours New Zealand, which focus on great biking and exploring the remarkable beauty of New Zealand. 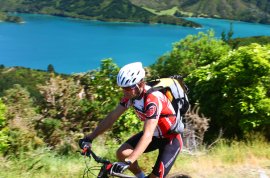 You have the thrills of both road cycling and mountain biking, both on and off the beaten track, as well as discovering the awesome culinary pleasures of New Zealand’s distinctive food and wines. Our tours of small, personal groups are designed for bikers by bikers and you always have your knowledgeable guide by your side. All tours areaccompanied by mini bus and trailer so not only can you rest when you want to, but we also carry your luggage for you, and take care of the catering and accommodation. Ralph and Hedley organise and run all our New Zealand trips along with their team, they have been running biking tours in New Zealand since 1987, so you are in very good hands with them! Our responsible approach towards the natural environment has even gained special concessions from the Department of Conservation and private landowners to have access to off-road areas that are normally closed to the public! 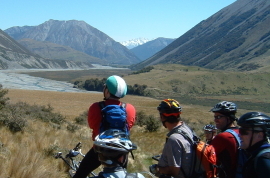 In some cases these concessions are exclusive to our tours, enabling you to access and enjoy New Zealand’s unique natural beauty like no other biking outfit can! Some of the best rides imaginable... some of the sweetest natural singletrack and technical descents I have ever ridden.